This stunning Czechoslovakian cased glass beverage set includes an 8" tall pitcher and six 4-1/2" glasses. 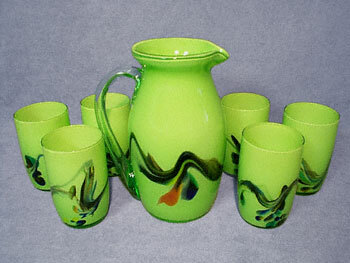 The artist used a variety of lovely contrasting colors in a swirl design on the green base pieces and encased them in clear glass. The pitcher holds about 44 fluid ounces and is embellished with a clear glass applied handle. There is no longer a paper identification label, and there are no chips or cracks. This elegant set is a fabulous representation of Czech cased glass, and is perfect for serving beverages with magnificent style.